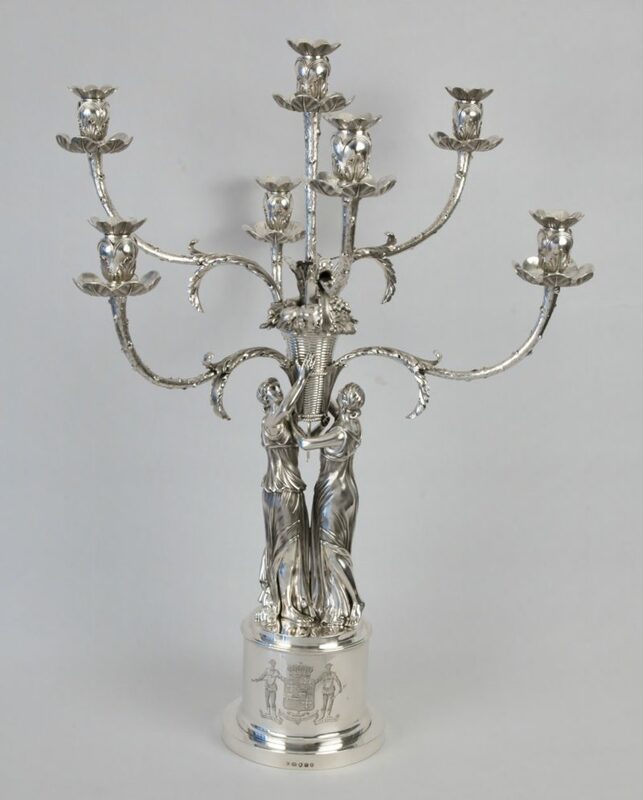 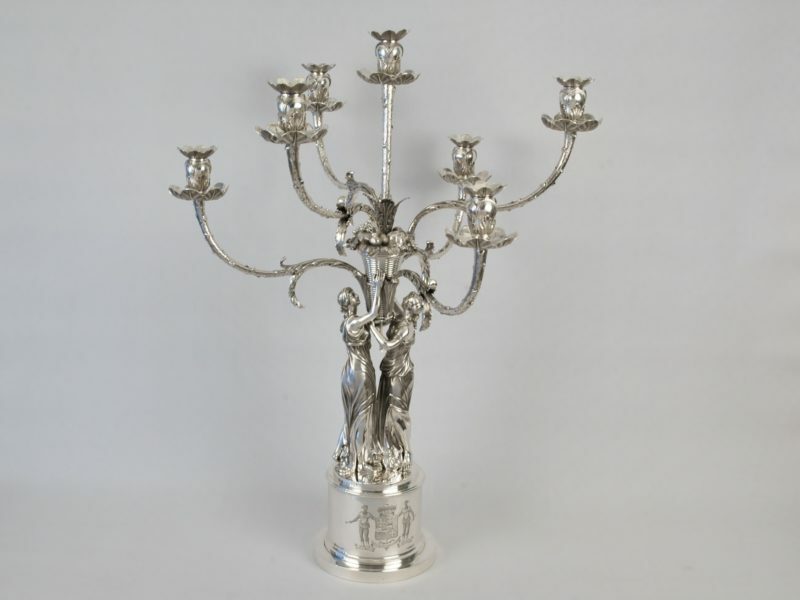 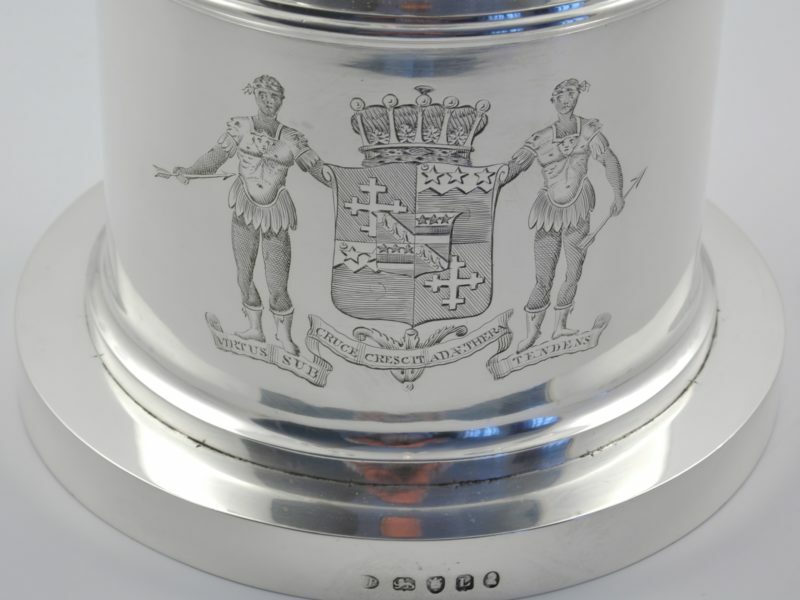 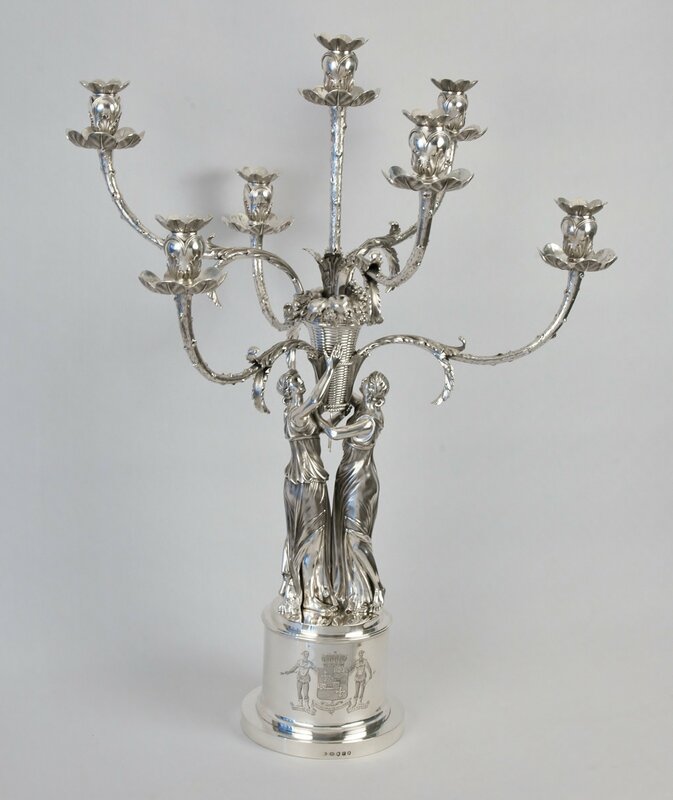 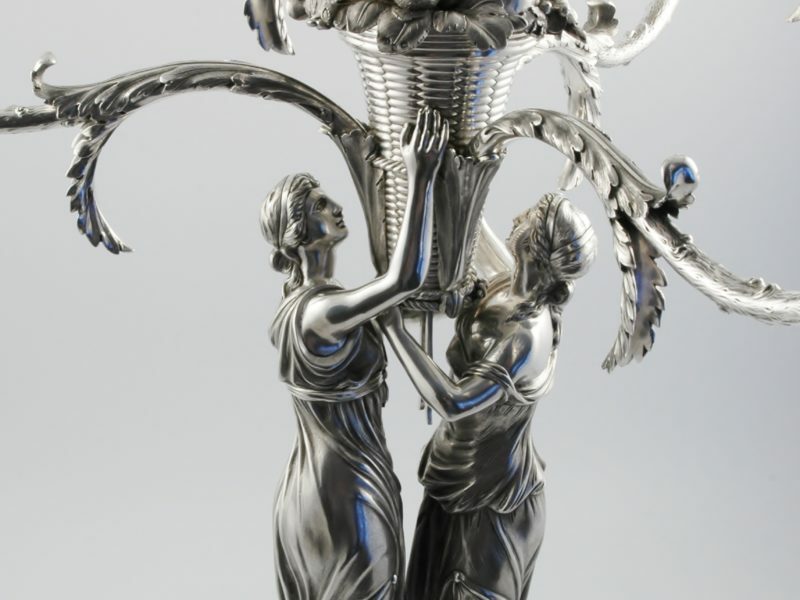 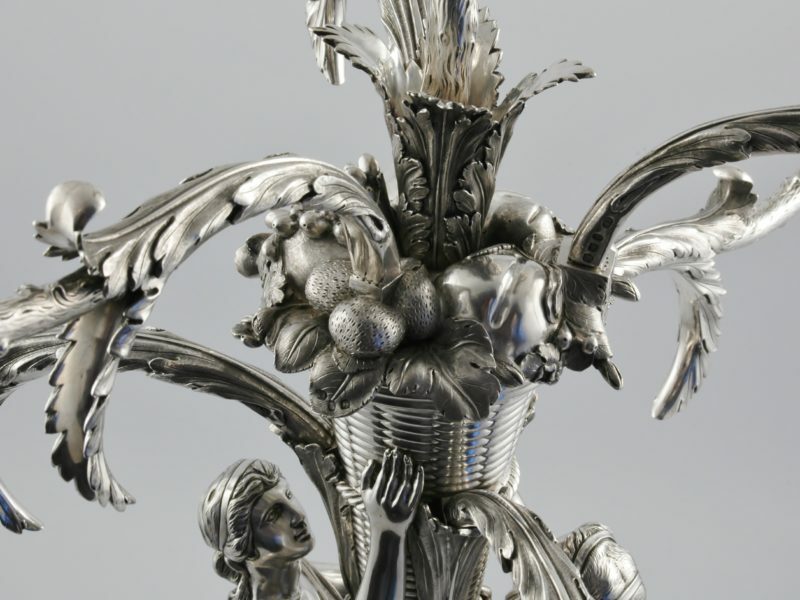 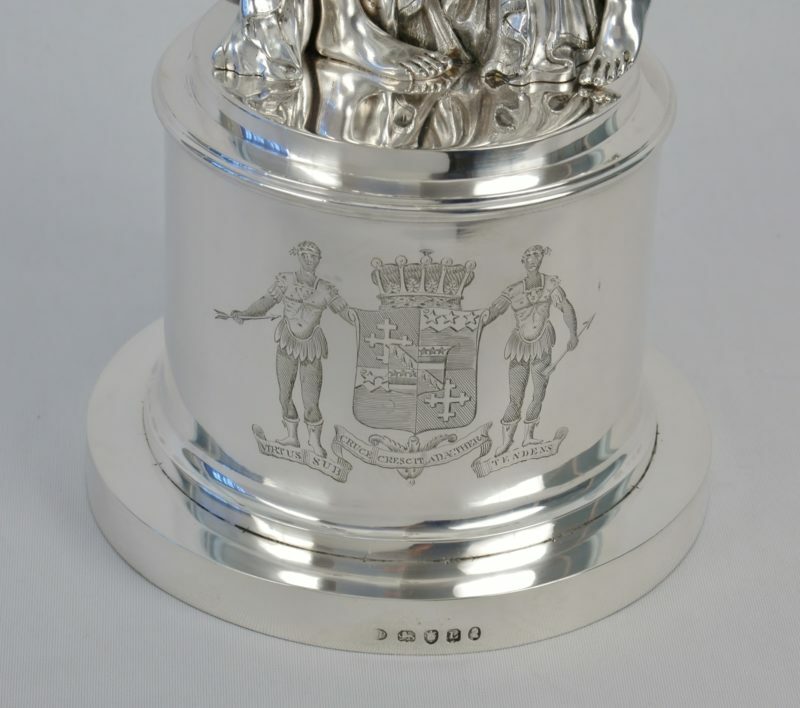 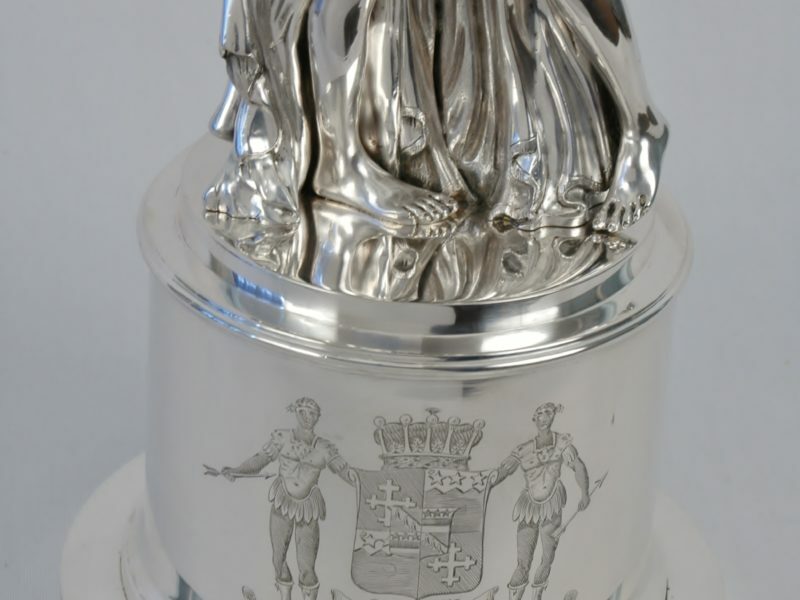 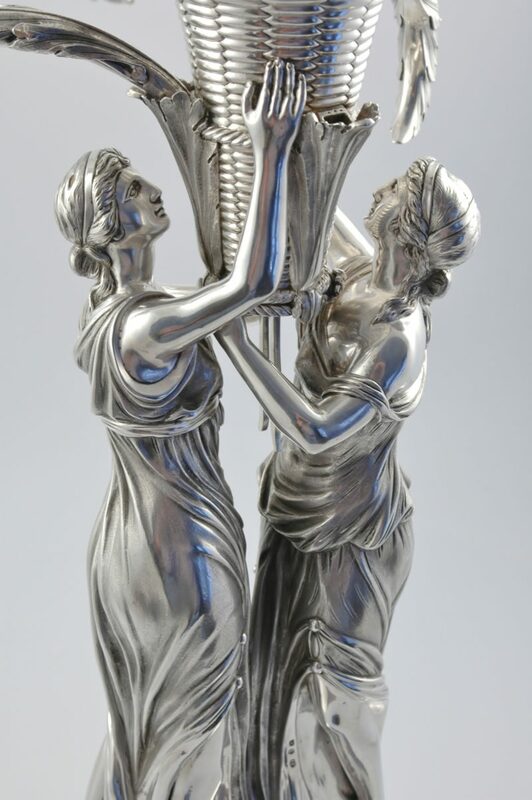 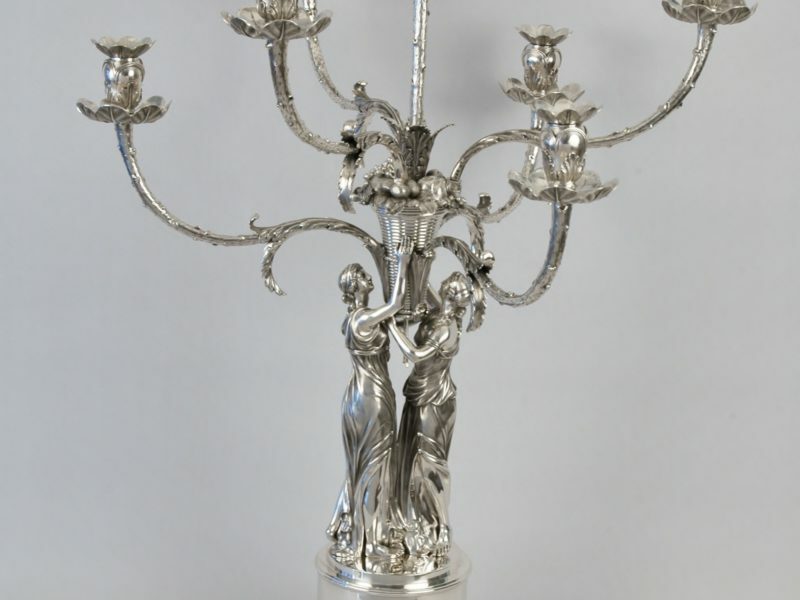 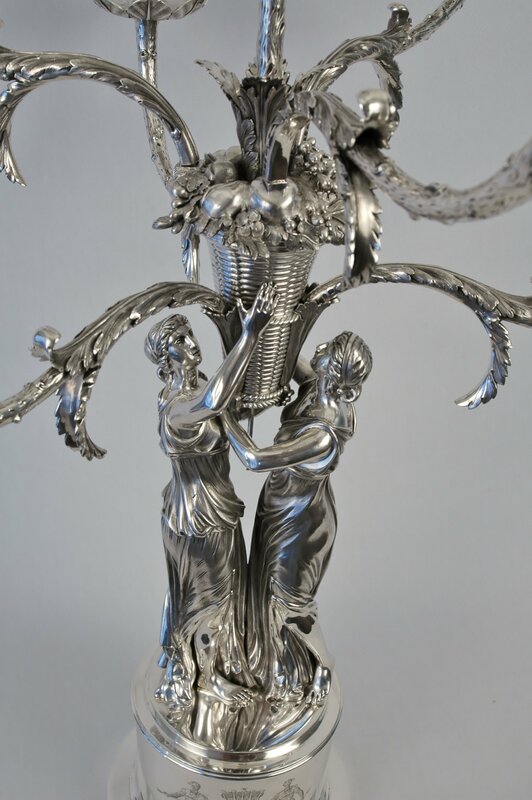 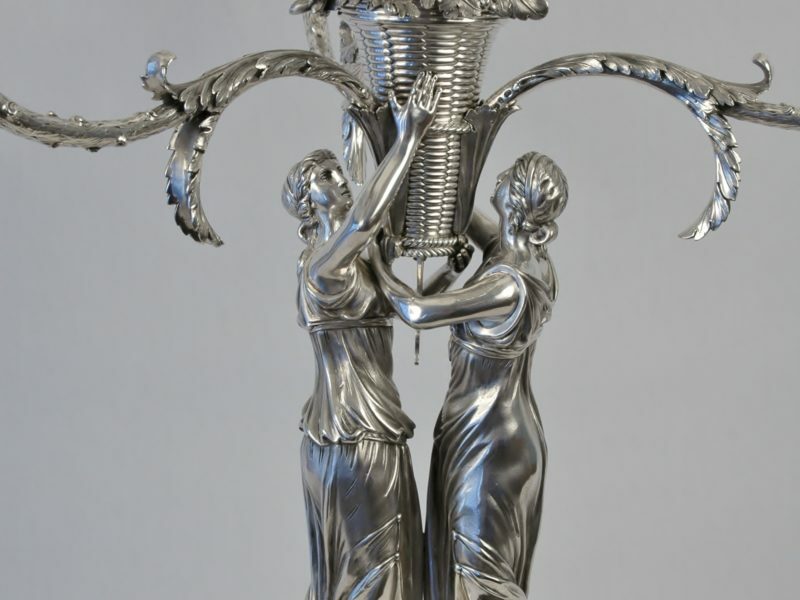 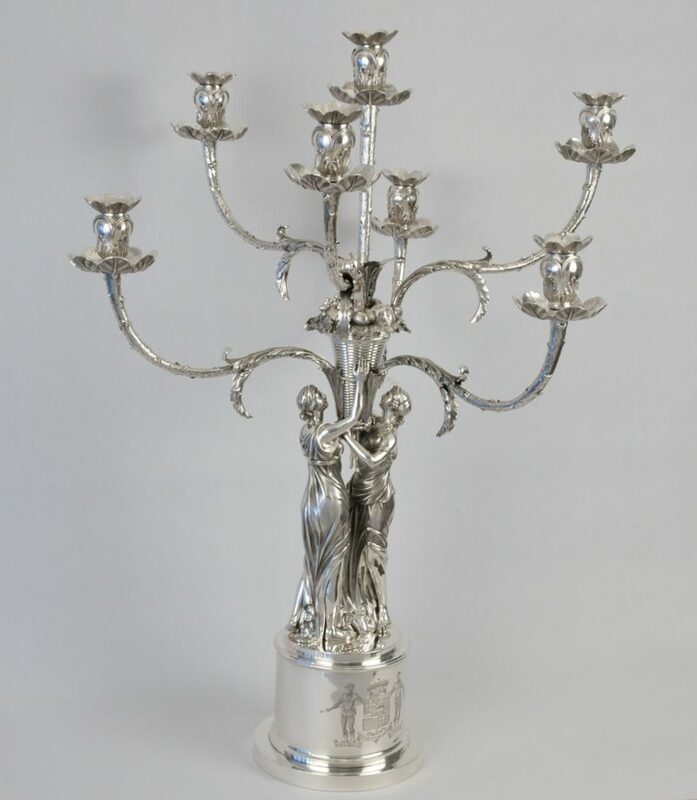 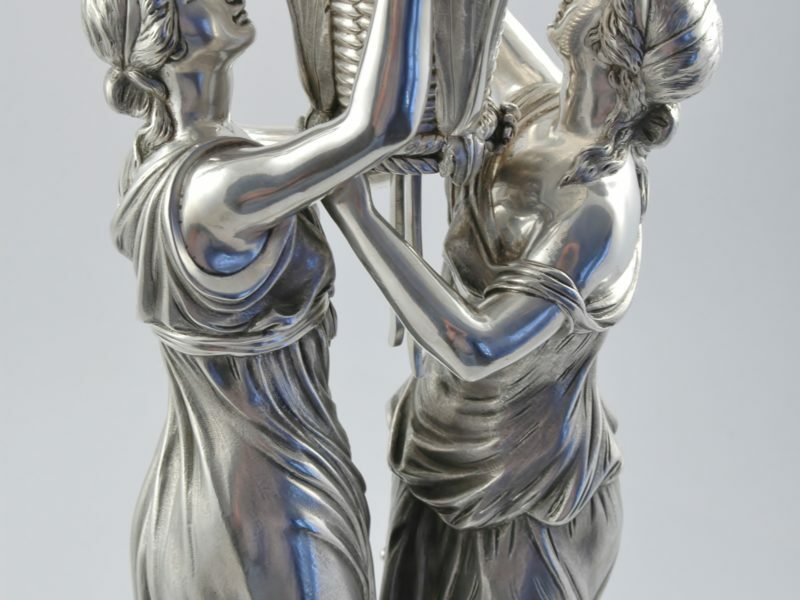 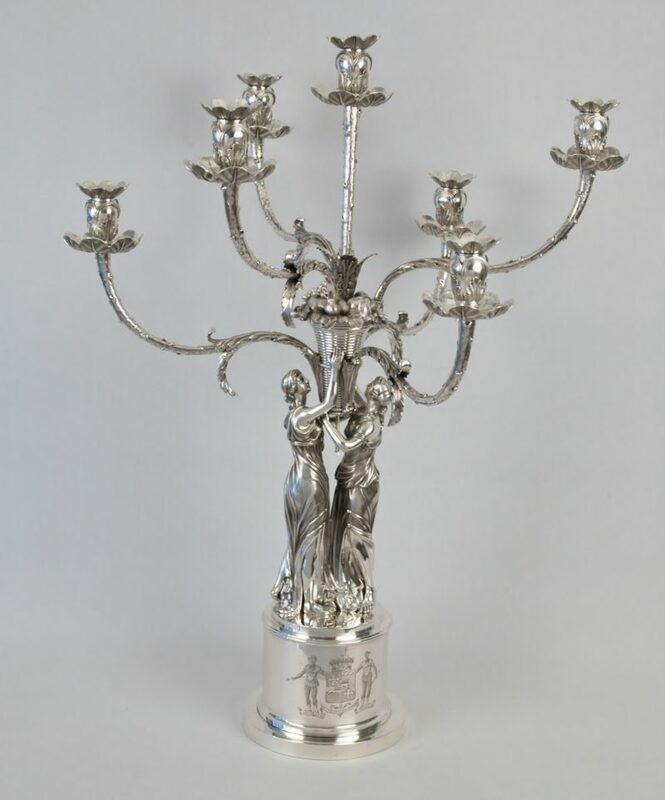 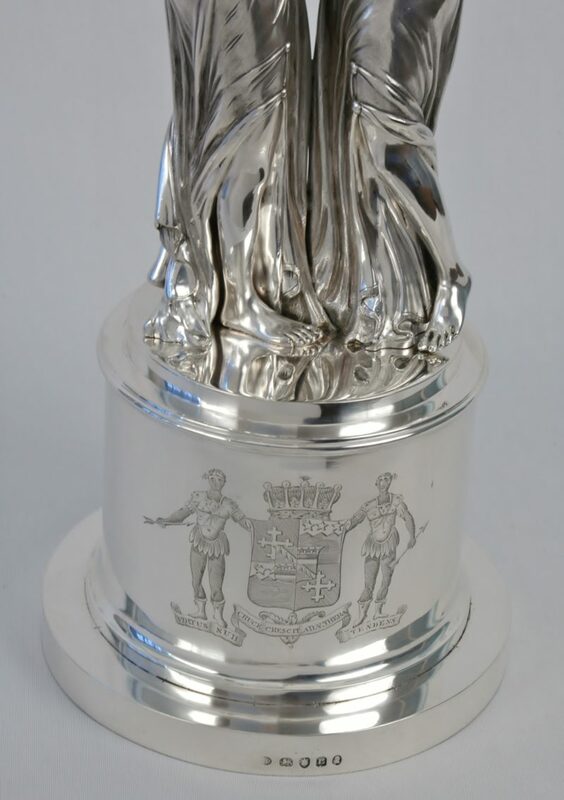 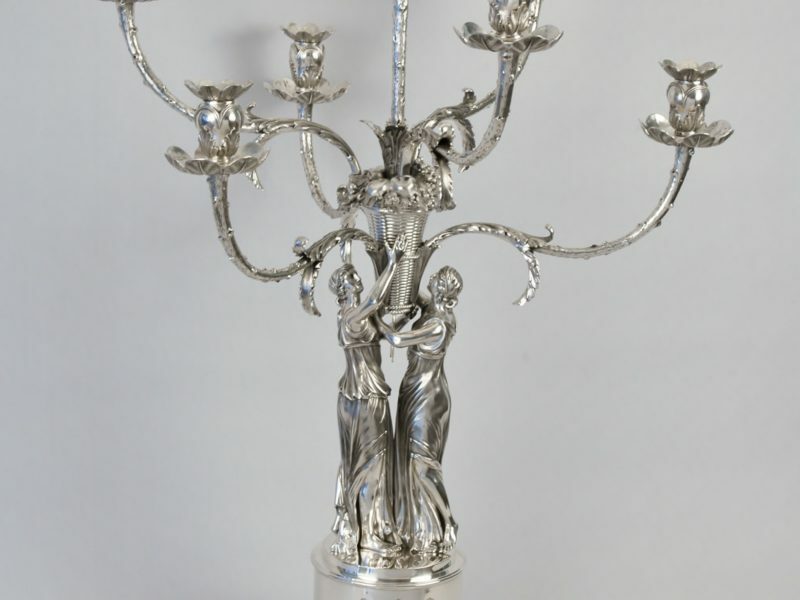 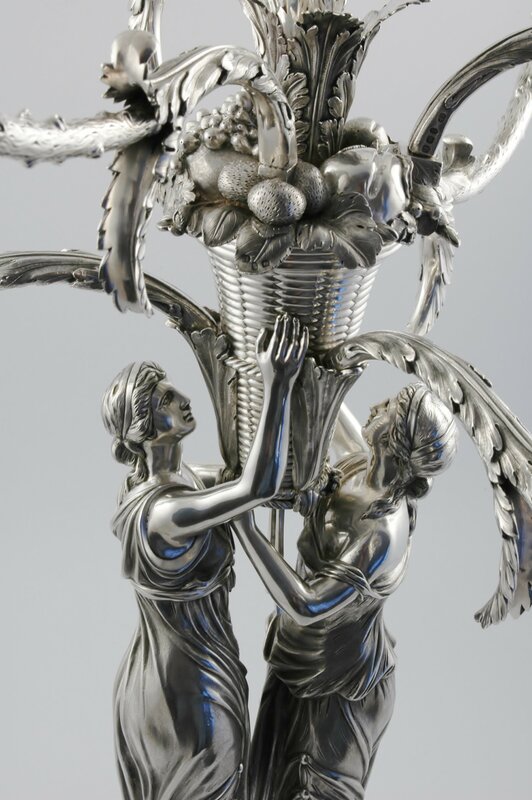 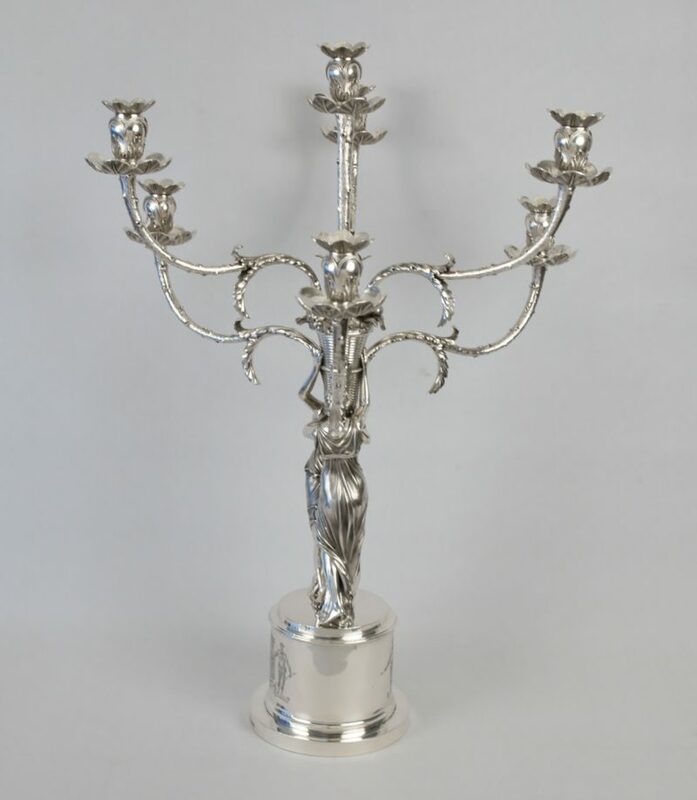 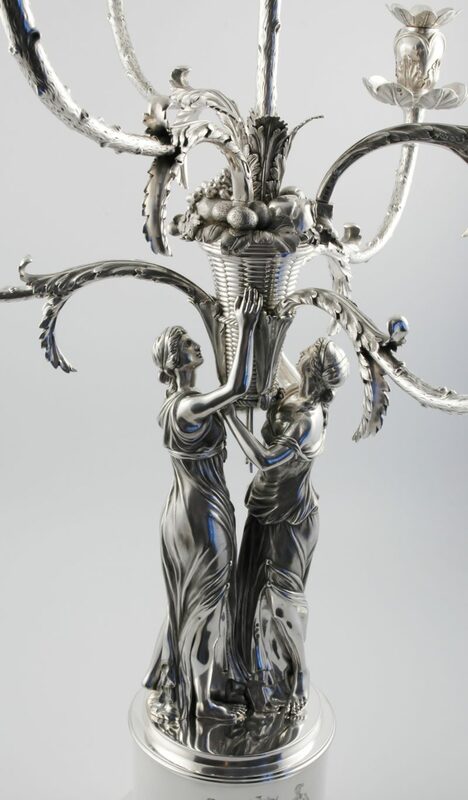 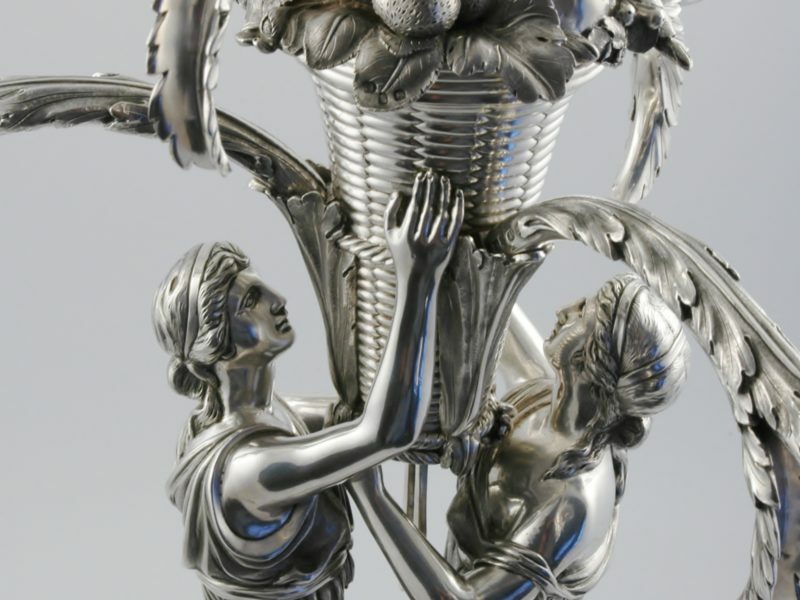 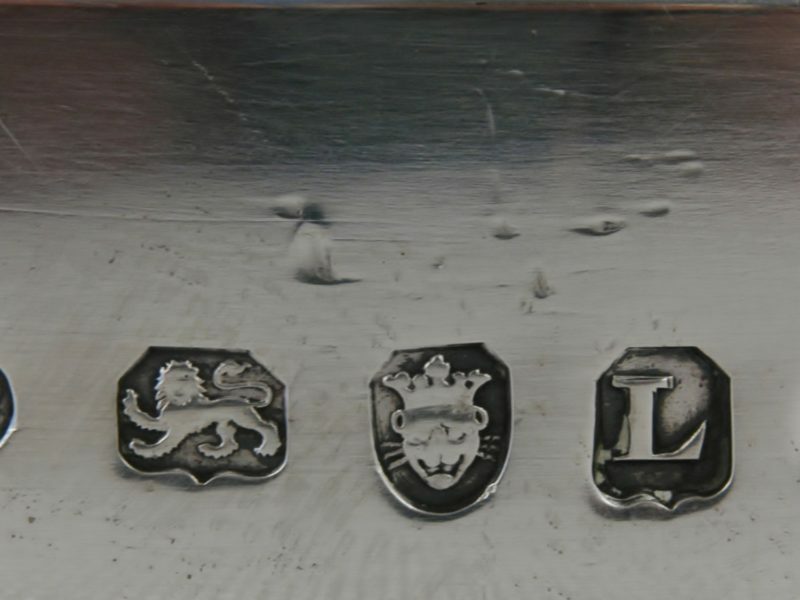 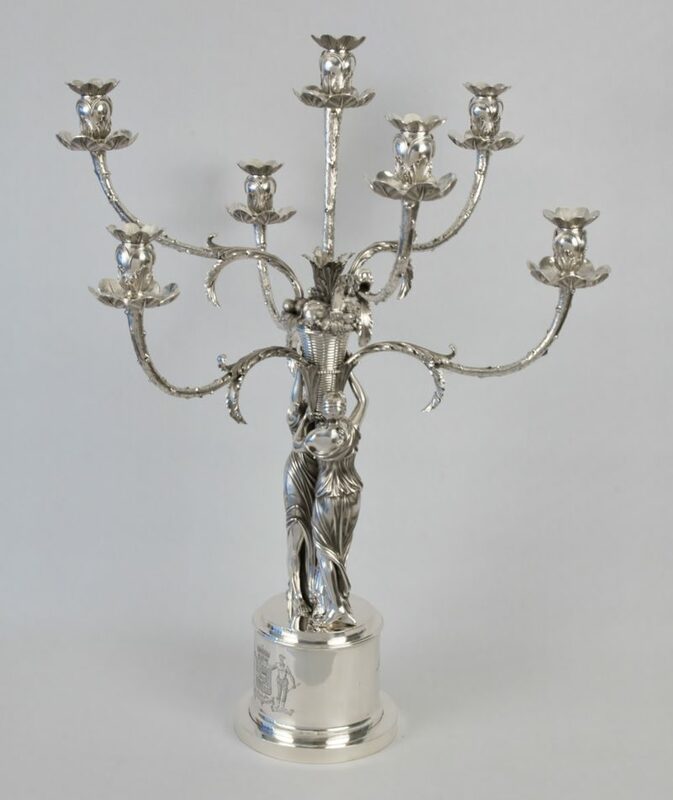 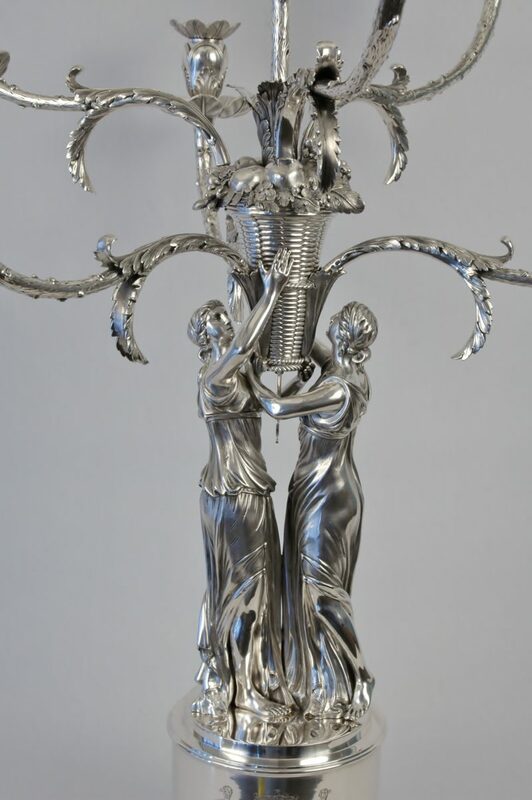 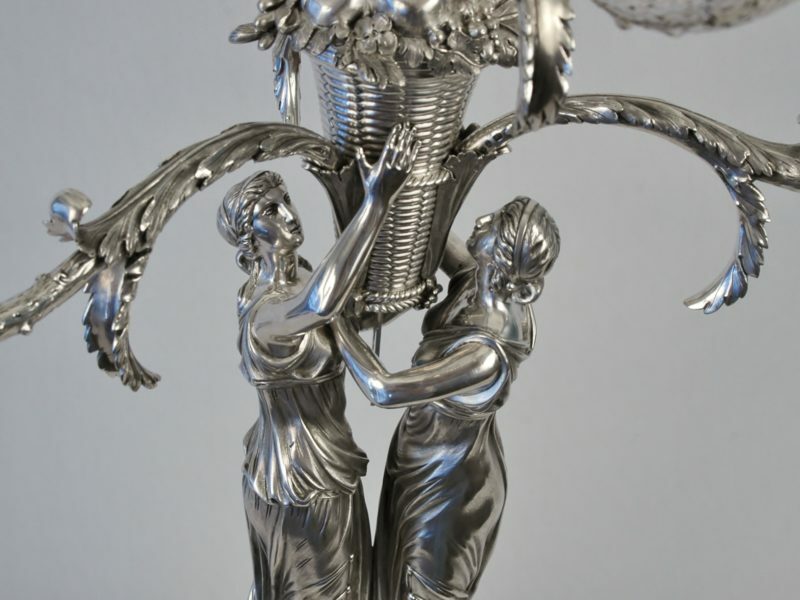 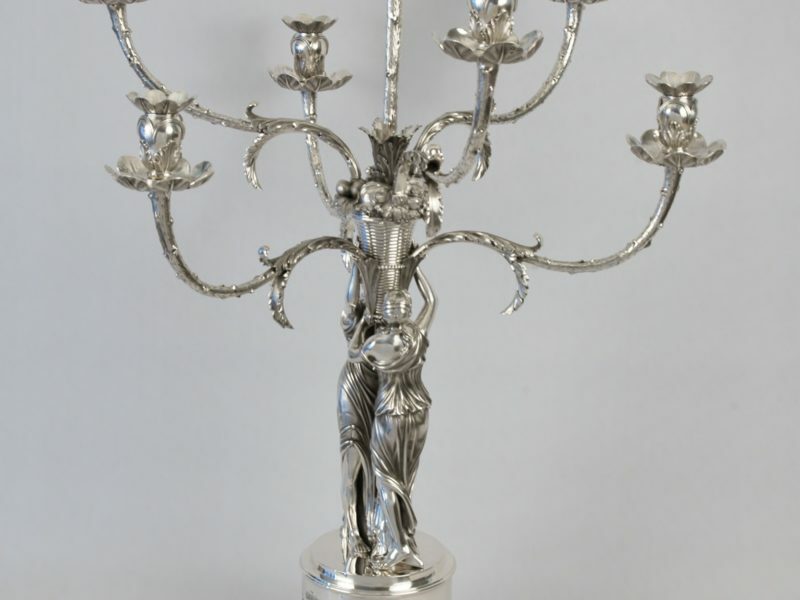 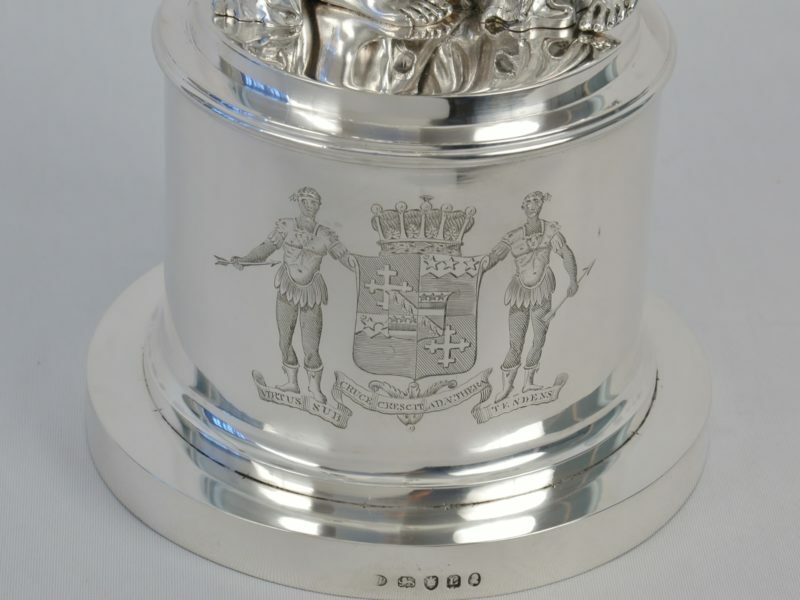 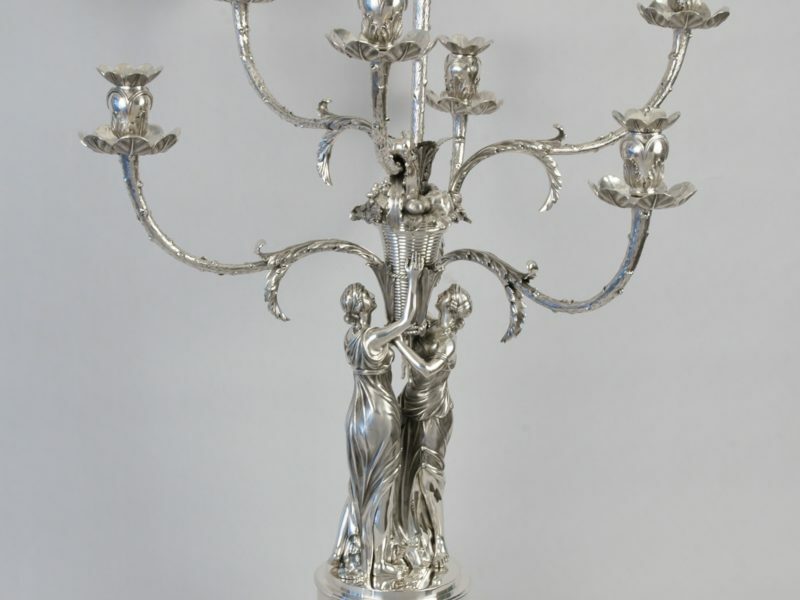 George III silver seven light, figural candelabra marked for London 1806 by Joseph Preedy. 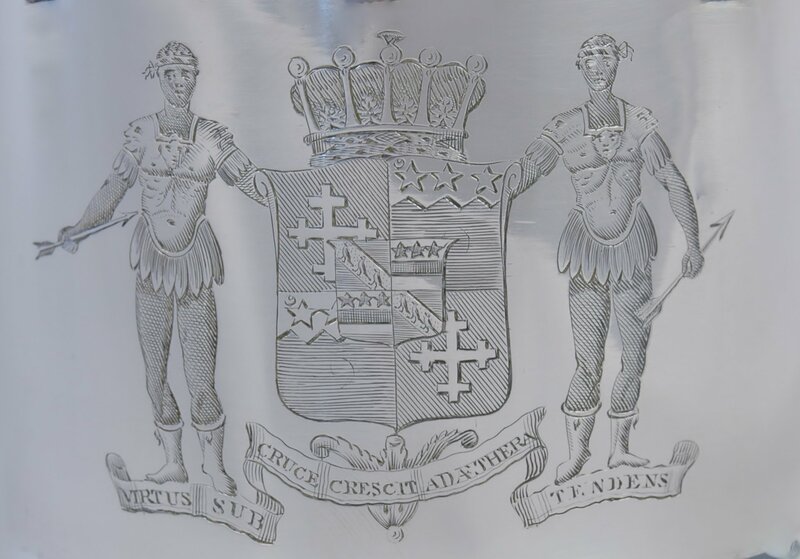 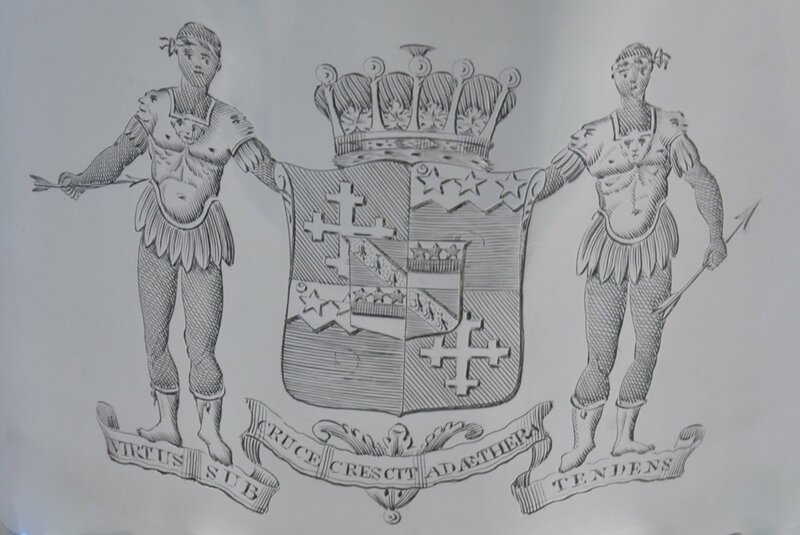 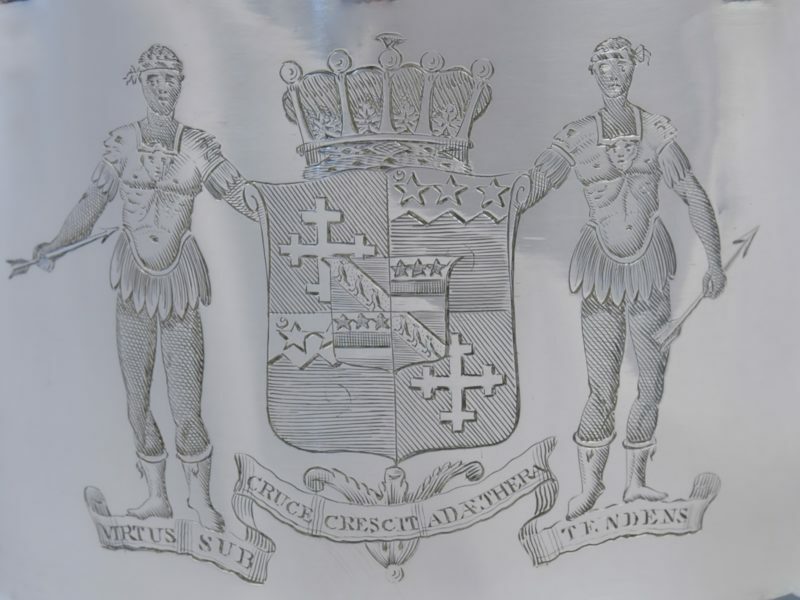 The arms are those of the first Earl of Charleville created in 1806 in the Peerage of Ireland, and those of his wife Catherine Maria Dawson. 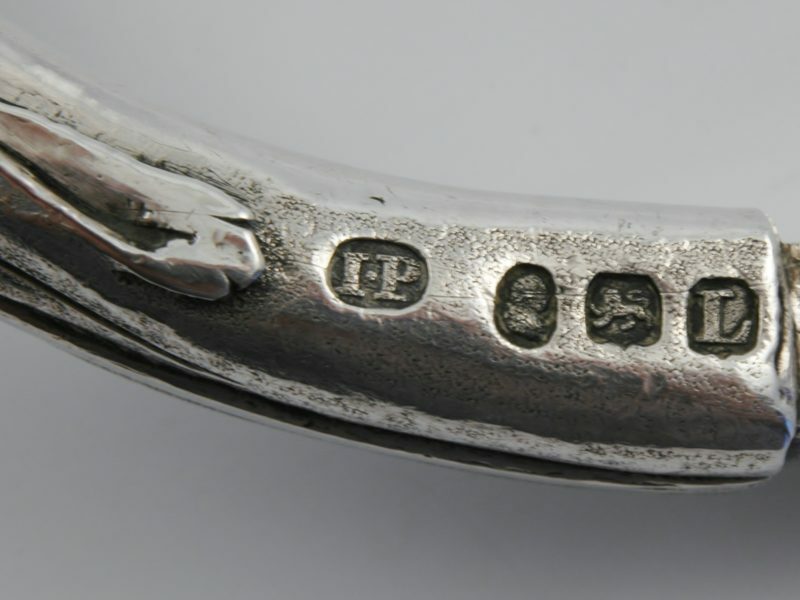 She was the daughter and heir of Thomas Townley Dawson of Kinsaley co Dublin and they were married in 1798. The Earl, born Charles William Bury, was created Baron Tullamore of Charleville Forest in 1797, Viscount Charleville of Charleville Forest in 1800, and Earl of Charleville in 1806. 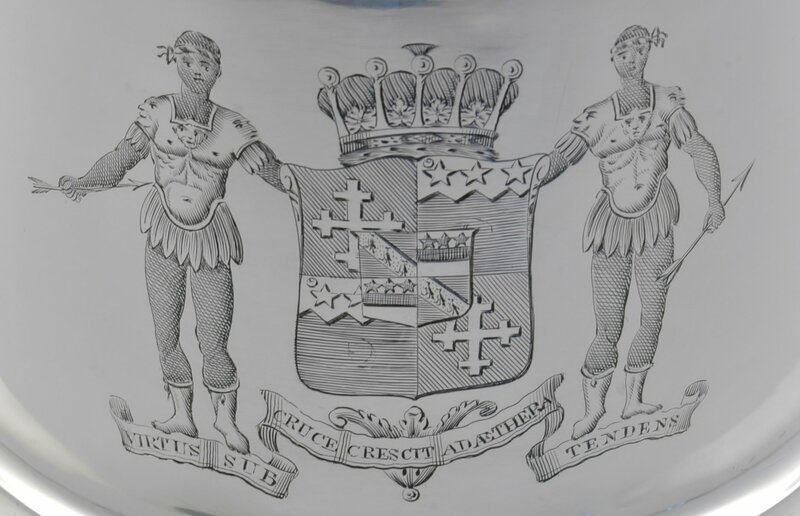 Charles William Bury, 1st Earl of Charleville FRS, FSA (30 June 1764 – 31 October 1835) was an Irish landowner, antiquarian and politician. 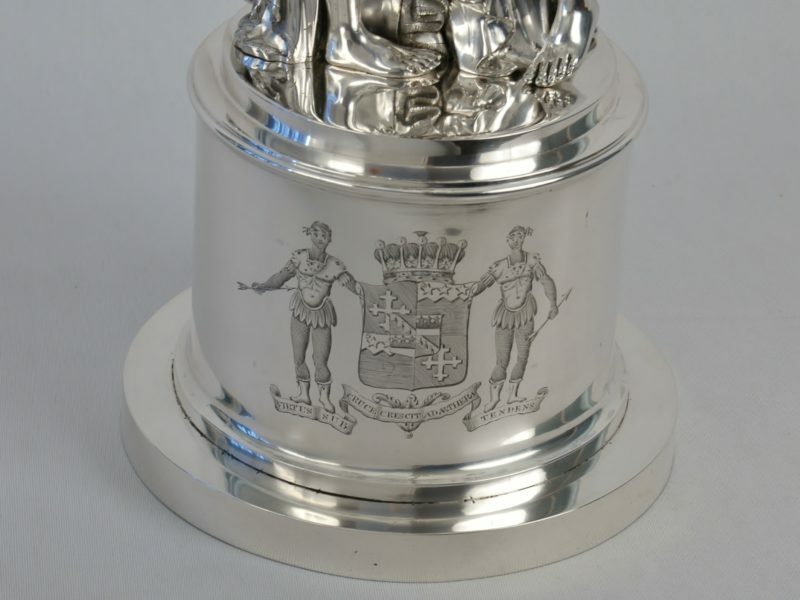 Between 1797 and 1800 he was known as The Lord Tullamore and as The Viscount Charleville between 1800 and 1806. 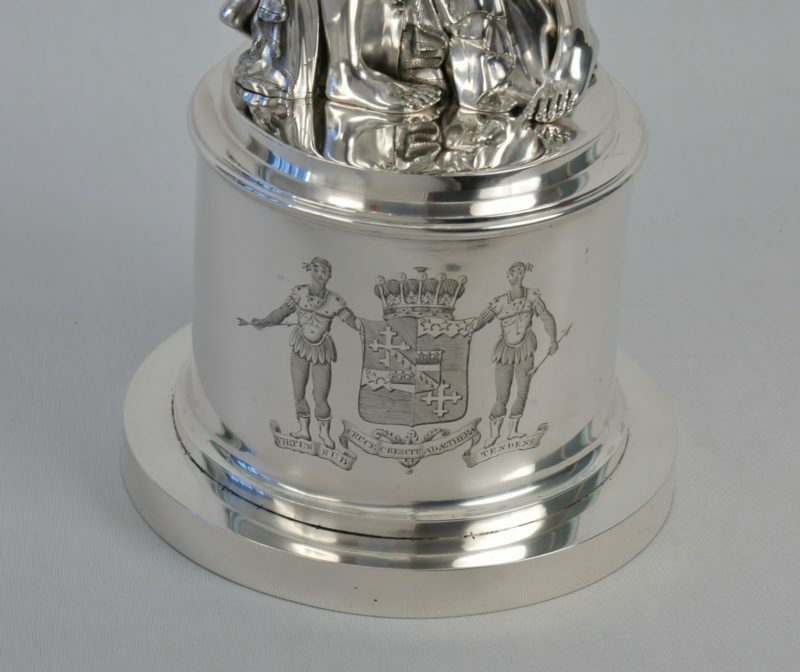 He represented Kilmallock in the Irish Parliament from 1792 until 1797. In 1798, he helped quell the Irish Rebellion and in 1801, he was elected an Irish Representative Peer. 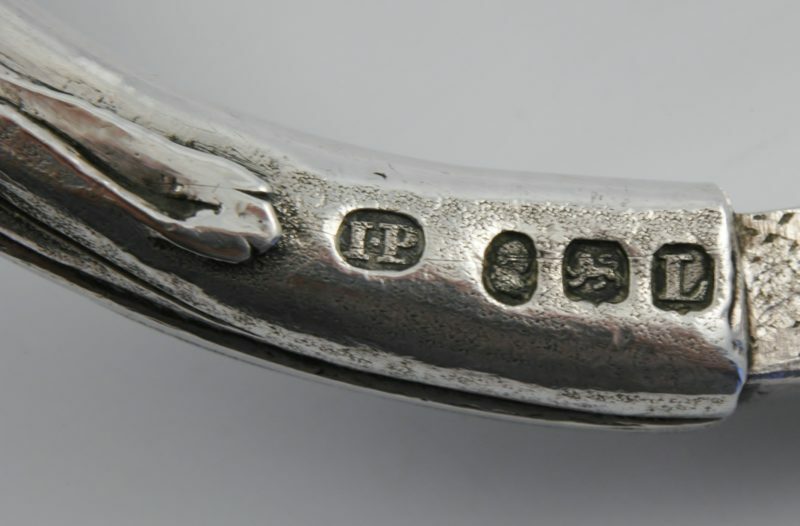 He was elected a Fellow of the Royal Society (FRS) in 1803. 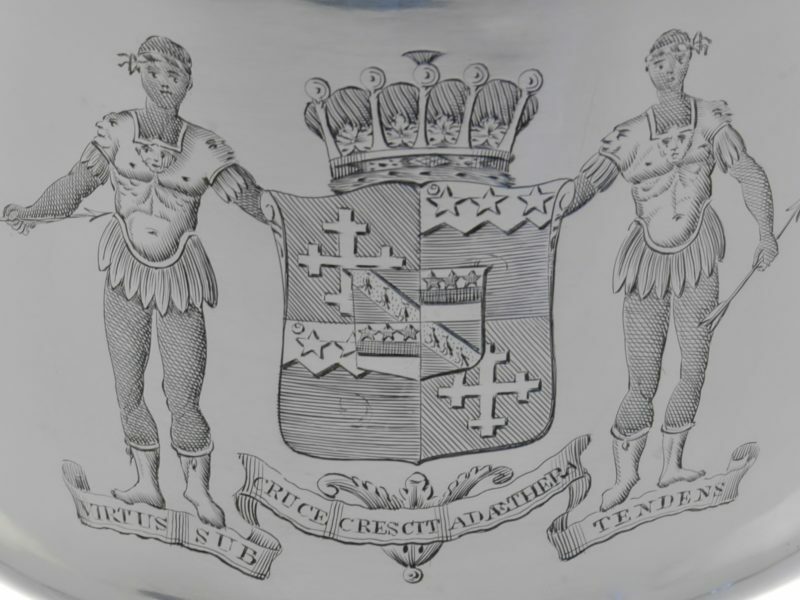 In 1806, he was further honoured when he was made Earl of Charleville in the Irish peerage, reviving the title that had been made extinct on the childless death of his grandmother’s brother. 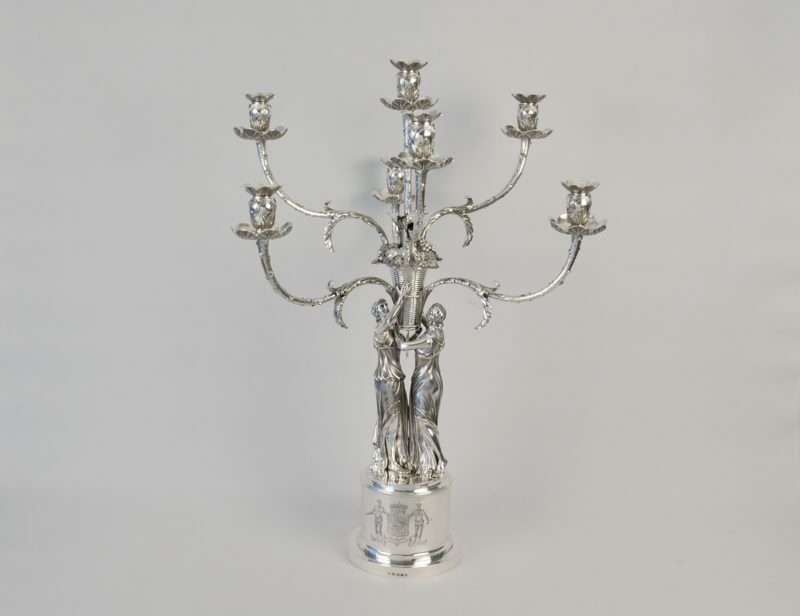 From 1798 he and Lady Catherine Marie Charleville conceptualised and directed the rebuilding of Charleville Castle. 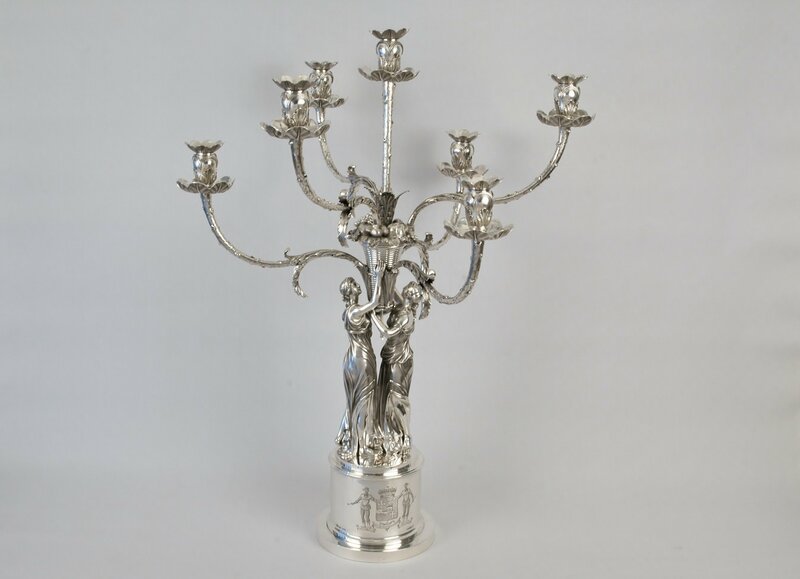 Designed by Francis Johnston, one of the leading architects of the day, it is the finest example of gothic-revival architecture in the country. 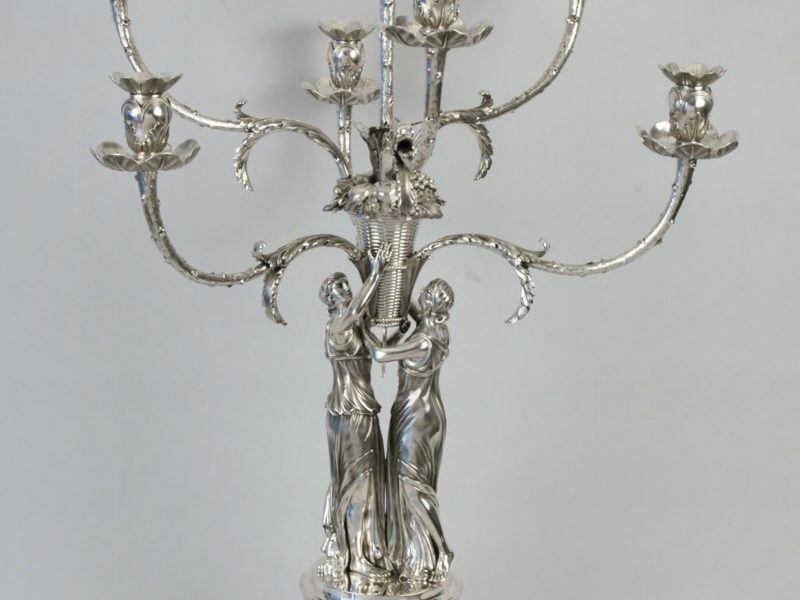 The Earl also developed the town of Tullamore and over the course of the next fourteen years, through the craftsmanship and skills of Irish workmen, Charleville Castle became the finest neo-Gothic castle in Ireland. 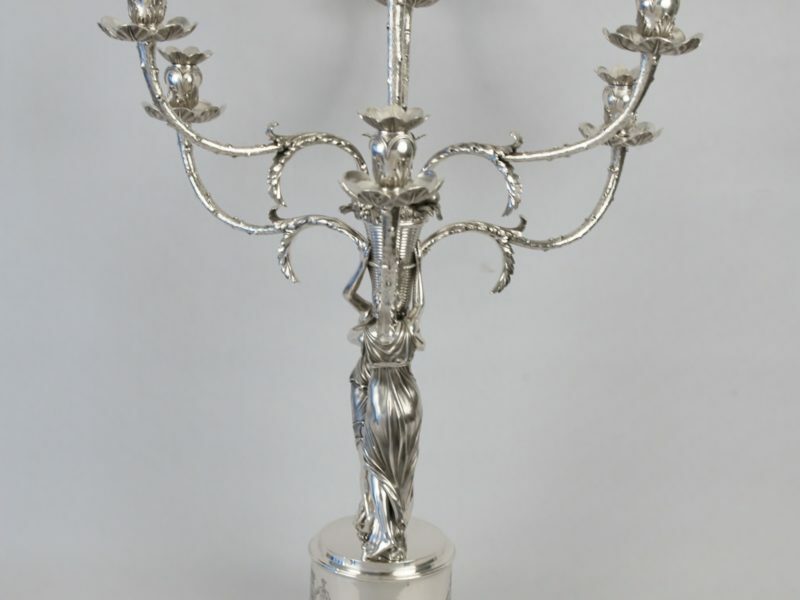 In 1814, he was elected a Fellow of the Society of Antiquaries (FSA) and between 1812 and 1822 he served as President of the Royal Irish Academy. 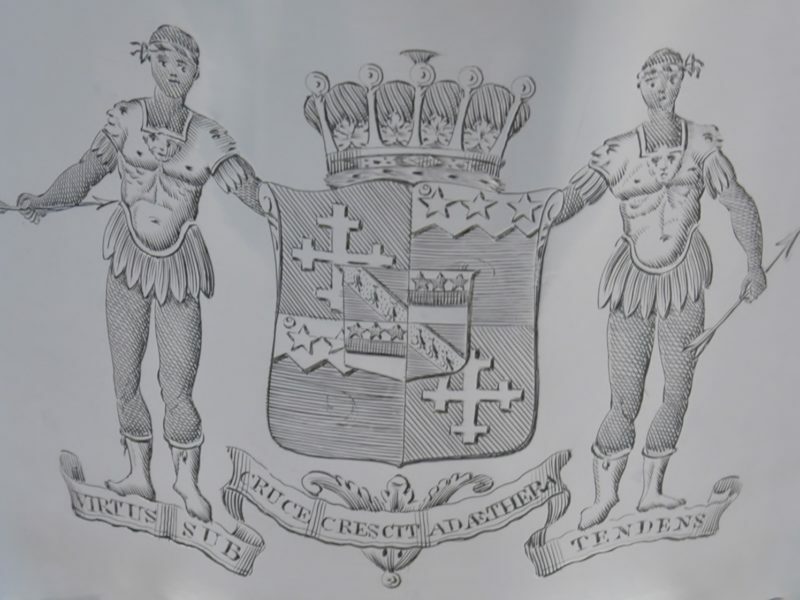 He died at Dover, Kent, in October 1835, aged 71, and was succeeded by his son, Charles. 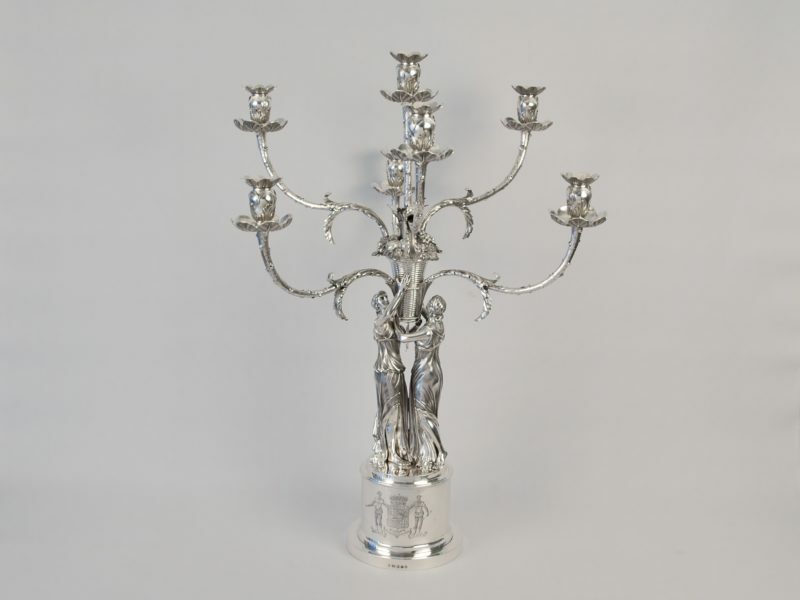 The Countess of Charleville died at Cavendish Square, London, in February 1851, aged 88.